The Recording Connection Welcomes Paul L. Marshall in Cape Coral, Florida! 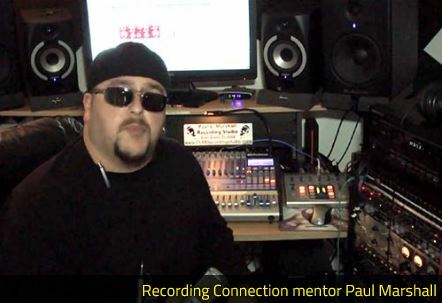 We’re very pleased to announce one more world-class industry professional has become a Recording Connection partner–Paul L. Marshall, chief engineer, producer and owner of Paul L. Marshall Recording Studio located in Cape Coral, Florida! A gifted drummer, Marshall’s musical interests eventually led him into the studio and onto the mixing console. From there, he started doing live sound and recording for bands like Linkin Park, Nickelback, Staind and Godsmack. Today, Marshall’s studio offers recording and live pro audio services to a wide range of clients. This puts him in great position to mentor our students in an array of musical and audio pursuits. We’re excited to include Paul L. Marshall as one of our mentoring partners. We look forward to seeing what our apprentices in south-west Florida can accomplish under his expert guidance! Anthony Montejo Get’s His Career Rolling with Donny Baker and Jam In The Van!